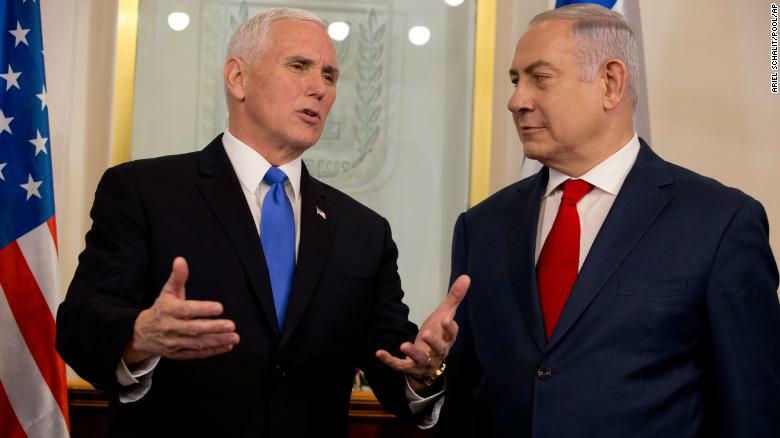 Jerusalem (CNN) The US will open its embassy in Jerusalem "before the end of next year," US Vice President Mike Pence said Monday in the Israeli parliament, where he reiterated the city was "the capital of the state of Israel." Pence is the most senior US official to visit Jerusalem since President Donald Trump's announcement last month that his government recognized the city as Israel's capital and would move its embassy there, upending seven decades of US policy on the issue. Both Israelis and Palestinians consider Jerusalem as their capital. At the Knesset, Pence said it was thanks to Trump that "the alliance between our two countries has never been stronger, and the friendship between our peoples has never been deeper -- and I am here to convey a simple message from the hearts of the American people. America stands with Israel." "We stand with Israel because your cause is our cause, your values are our values, and your fight is our fight." US Vice President Mike Pence, left, with Israeli Prime Minister Benjamin Netanyahu in Jerusalem on Monday. 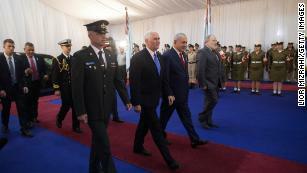 Pence was earlier given a warm welcome to the office of Prime Minister Benjamin Netanyahu, greeted by an honor guard as the US national anthem played. He said he was "hopeful that we are at the dawn of a new era, of renewed discussions to achieve a peaceful resolution to the decades-long conflict that has affected this region." US Vice President Mike Pence, center left, with Israeli Prime Minister Benjamin Netanyahu, center right, at a welcome ceremony in Jerusalem on Monday. He added that Trump's December 6 announcement "would create an opportunity to move on in good-faith negotiations between Israel and the Palestinian Authority." When asked whether the US embassy could be moved to Jerusalem by next year, Netanyahu grinned and quipped that it could be "by next week." When asked if he was serious, he responded: "No. But we want to do it." Pence is due to give remarks in the Israeli parliament, the Knesset, later Monday. A member of the Knesset, Ayman Odeh, said that he and other Arab-Israeli lawmakers would boycott the speech. "In response to voices that are against our decision, we will not be silent about the speech made by a dangerous racist whose whole reason for being here is in order to damage any chance of peace," he wrote Saturday on Twitter, announcing the boycott. On Monday, he wrote, his position was unchanged, calling Pence "a dangerous man with a messianic vision" sent by "an even more dangerous man, a political pyromaniac, a racist and interferer." The United States Congress in 1995 passed a law requiring the US to move its embassy from Tel Aviv to Jerusalem. But all US presidents before Trump have resisted acting on the law, signing a waiver in the national interest. At the time of his announcement last month, Trump denied he was reversing US policy and reaffirmed the US' commitment to helping Israelis and Palestinians reach a peace agreement. Palestinian Authority President Mahmoud Abbas has repeatedly condemned and rejected Trump's decision, saying, among other things, that it would aid extremist organizations to wage holy wars.